Marilla and Mathew Cuthbert had planned to adopt a boy to help out around Green Gables farm. 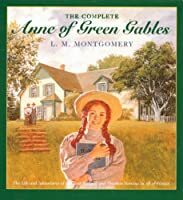 But waiting for Mathew at the train station is freckle-faced, red-headed Anne Shirley - a talkative eleven-year-old orphan with a heart full of dreams and a desperate longing for a home. From the minute Anne sets foot in Mathew's buggy, Green Gables will never be the same! read the series to my daughter....LOVE!!! I adored this book as a child! Seeing it here makes me want to read it again!